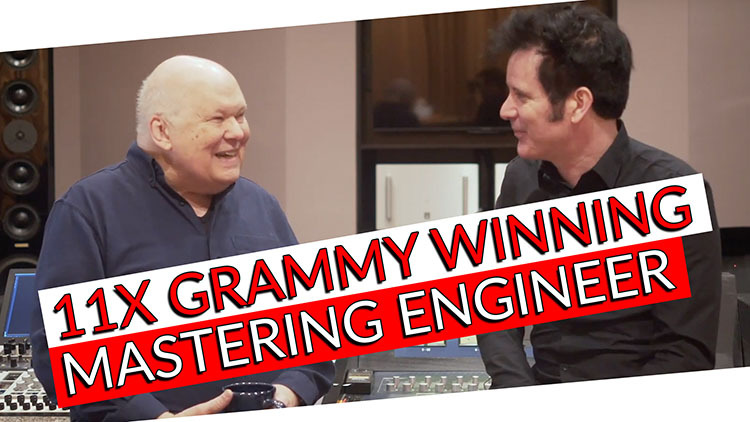 Bob Ludwig is an 11-time GRAMMY-winning mastering engineer, as well as the recipient of an incredible 18 TEC Awards for his achievements as an individual and as a business owner. Bob grew up in a small town in New York where he first started tinkering with tape machines at an early age, making recordings of radio broadcasts. As a young adult he pursued classical musicianship, earning both Bachelor’s and Master’s degrees from the Eastman School of Music of the University of Rochester, New York. There, he also participated in the audio department while playing principal trumpet with the Utica Symphony Orchestra. Bob first got a shot in the recording business after legendary engineer/producer Phil Ramone came to the University of Rochester to teach a summer recording workshop. Bob became Ramone’s de-facto assistant for the course’s duration, namely because of the time he spent in the recording department at the University of Rochester. Afterwards, Ramone offered him a position at A&R Recording, which he had co-founded in 1958, and became Bob’s mentor. Bob had the pleasure of working with Phil on sessions with The Band, Peter, Paul & Mary, Neil Diamond, Burt Bacharach, and many others. After a stint at A&R Recording, Bob was offered a position at Sterling Sound, a premier mastering facility headquartered in New York City with current studios in New Jersey and Nashville. He officially became their first employee, where he would stay to see himself become vice president! After almost ten years years at Sterling, he moved to Masterdisk (which was once owned by the same company as Sterling) where he worked as vice president and chief engineer. In 1992, Bob opted to take complete control of his career by starting his own business: a mastering studio in Portland, Maine called Gateway Mastering. Bob’s mastering credits are extensive, and are “ball parked” at nearly 4000 according to AllMusic! His résumé includes albums by many household names, including Led Zeppelin, Jimi Hendrix, Phish, Megadeth, Metallica, Gloria Estefan, Nirvana, The Strokes, Queen, U2, Guns N’ Roses, Tool, Simple Minds, Bryan Ferry, Tori Amos, Bonnie Raitt, Beck, David Bowie, Paul McCartney, Bruce Springsteen, the Bee Gees, Madonna, Supertramp, Pet Shop Boys, Radiohead, Elton John, and Daft Punk. Of course, this list is by no means comprehensive, showing only a small portion of his incredible career as a mastering engineer! In our conversation with Bob Ludwig, he proudly stated, “This is the best job in the world—I would never complain about this job, even though it’s pretty long hours…everyday it’s like having a very complex puzzle to figure out.” The sentiment probably rings true for most audio professionals, to those who may be just starting off and those lucky enough to have a career like Bob’s! After all, it’s all about a passion for music and doing our part to make amazing sounding records, which is certainly a privilege! He recalls that everyone who worked for Phil Ramone had to learn how to cut discs. Bob started off with a fixed-pitch lathe which required the engineer to select the right gear ratio for the material being cut. At the time, the options were 105 lines-per-inch or 130 lines per-inch. If the low end, for example, was too loud in a song, it would literally cross over into the groove next to it. During his time cutting discs at A&R, Bob discovered he was “genetically predisposed” to mastering and never left the disc-cutting room! Because of his ability to read scores from studying classical music at Eastman, Nonesuch Records chose Bob and A&R Recording to start mastering their catalogue. To this day, Bob still works closely with Nonesuch. After a year and a half at A&R, Neumann introduced the SX 68 cutterhead, which Bob describes as “like going from 7.5 to 30 IPS.” It was a huge advancement in record-cutting technology, though at the time, A&R couldn’t (or wouldn’t, perhaps?) spring the money for the latest Neumann machine. It was then that the brand new Sterling Sound operation was getting off the ground, complete with all of the latest in mastering technology, where Bob would be hired as the first employee. For such a short time at A&R Recording, Bob had the amazing opportunity to work with Phil Ramone on albums by The Band, Peter, Paul & Mary, Neil Diamond, and Burt Bacharach. Bob left A&R Recording for the fledgling Sterling Sound after about 2 years. Enticed by Sterling’s investment in all the latest mastering equipment and tech, he became the company’s very first employee, embarking on the second major venture in his career. Over the course of his time at Sterling, Bob became the company’s vice president. Not many engineers have had the opportunity to climb the ranks in quite the same way! By 1973, Masterdisk was founded as a spin-off of Mercury Records’s recording, editing, and mastering arm. The company who owned Sterling also owned Masterdisk, and Bob made the move after Sterling offered him what he remembers as a terrible contract—something, he joked, which would be “illegal” by today’s standards. Though the records Bob worked on at Sterling and Masterdisk are practically innumerable, he fondly recalls doing Frank Zappa’s 1979 double album Sheik Yerbouti over the course of three days at Masterdisk. In terms of sonics, Zappa imagined his album sounding like something done today would, which required Bob to memorize countless different EQ moves. Zappa’s ears were so good that he caught Bob’s accidental boost of 2 dB at 250 Hz—with a sharp Q instead of a medium one! After some 20 years working for other companies in New York, and again becoming a vice president as well as chief engineer at Masterdisk, Ludwig decided to start his own business in Portland, Maine in the early ’90s. Bob opened Gateway in 1993 after partnering with Dan Crewe, a music business veteran. The decision to open a business was largely influenced by Bob’s desire to handpick the studio’s equipment and location. So, he and Crewe developed a business plan and chose Portland, Maine as the studio’s home. There was some hesitancy to settling the mastering facility in Maine, though it was ultimately decided location was a non-factor since mastering sessions aren’t frequently attended by artists, producers, or mix engineers. Still, the studio has been frequented by the likes of Eric Clapton and Bruce Springsteen over the years, causing a bit of celebrity frenzy in Portland! Today, Gateway is run by both Bob and his colleague/former assistant Adam Ayan. Adam himself is a world-class mastering engineer, with a GRAMMY, 5 Latin GRAMMYs, and a TEC Award under his belt, in addition to numerous gold/platinum records and #1s. The main studio at Gateway is equipped for stereo and 5.1 surround mastering, with roll-out speakers tucked neatly into the room’s corners for use on surround projects. The massive L/R mains alone weigh around 800 pounds a piece! Then, split into 6 channels on either side of his desk, Bob uses two different flavors of mastering EQ. He has 6 channels of George Massenburg Labs EQ for the majority of his precision work. He notes that it’s a very transparent unit, and is almost imperceptible with all the settings at zero. On the other end of the spectrum are the tube Manley Massive Passive EQs, of which he also owns 6 channels. It has a unique character that imparts itself on the signal when that’s the sound he’s looking for. It works particularly well for coloring the sound and creating overall tone impressions on projects. Bob Ludwig is the mastering engineer’s mastering engineer. With handfuls of awards to his name and thousands of credits—many of whom are some of the most renowned artists in history—Ludwig’s career has shaped the way pop/rock music sounds over his many years in the business.